We almost never see skirt steak in the average supermarket, so when we did see it, we bought one and tossed it in the freezer for later. And then promptly forgot about it. After briefly contemplating frying some onions, I was lazy and chopped scallions to use raw. I also saw this to be a good time to use the watermelon radish we bought at MOM's Organic Market a few days earlier. Quick pickling seemed like the way to go. And of course, homemade corn tortillas, because they are so easy and better than store bought. The resulting tacos had nicely spiced and garlicky meat, and a nice sweet/tartness from the pickle. I stirred some powdered coconut milk (from a trip to H Mart) into a bit of Greek yogurt to use in place of crema, and threw together a simple tomato and scallion salsa. However, the best addition to the steak-and-radish taco was a bit of crumbled feta cheese, which added a nice bit of funky saltiness. Combine first six ingredients in a bowl. Place the steak in a zip-top bag and pour the marinade over. Massage the marinade into the steak for a few seconds, then close the bag, making sure to squeeze out as much air as possible. Refrigerate for at least 30 minutes and up to overnight. When ready to cook, preheat your broiler. Place oven rack in highest position. Remove steak from marinade, wipe off any chunky bits and place steak onto a baking sheet with sides. Broil 3-4 minutes per side, to medium-rare. Remove steak from oven and allow to rest 5 minutes before cutting against the grain into thin slices. 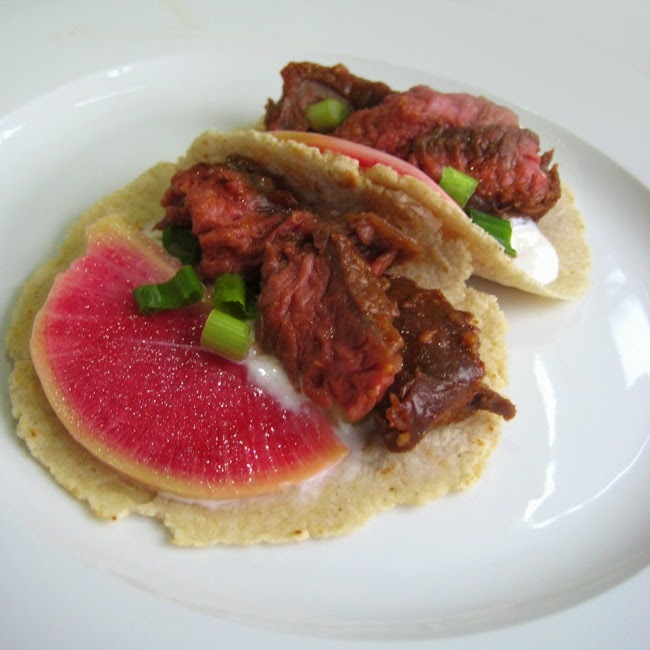 Serve as a filling for corn tortillas, with some pickled radishes, feta cheese, and sour cream or crema. Combine vinegar, sugar, and salt in a bowl. Add the radish and toss well to coat all radish pieces. Cover and refrigerate for at least 30 minutes. Drain liquid before serving.